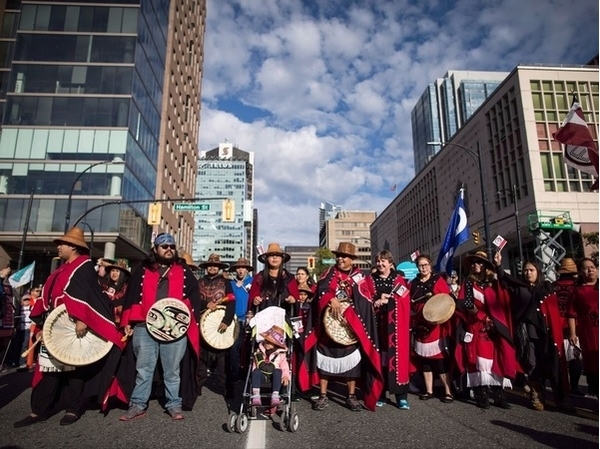 Last week's walkout by native leaders from extensive discussions with Ottawa about new rules for the assessment of natural resources and pipeline projects perfectly illustrated the vapidity of the present federal government's policy of pretending that it meets on an equal footing with these native organizations on a "nation to nation" basis. This is what Prime Minister Justin Trudeau promised the United Nations last month as he converted the annual general assembly meeting of that rag-tag of largely irresponsible and uncivilized countries into a confessional where Trudeau not only conceded that this country has pursued a colonial relationship with our native people for over a century (which is untrue), but also pledged to that raddled gallery, including an inordinate number of hypocrites and scoundrels, that Canada would pursue a policy based altogether on false premises. I suspect, but I am not a mind-reader and don't know, that the political strategists of the government think that Canada has an endless capacity for guilt and shame over the conditions of the native people. There is no doubt that most Canadians are concerned and distressed at the poor circumstances that afflict a great many native people, but their capacity to hold themselves responsible for it has been significantly mitigated by the scores of billions of dollars that have been directed at these problems without, apparently, making much progress to help the native people better their lot. All Canadians, and not just the natives, are frustrated and disappointed by this and are anxious to do better. Government policy is based on the concept that the native groups are sovereign in their spheres, in an identical jurisdictional condition to the Canadian government; that the natives have been shamefully mistreated from the moment of the first European settlements right to the present time, more than 400 years. There is implicitly a cloud or question over our moral right to be here at all. Centuries of Anglo-French and Canadian official policy toward the natives were, it is implied, culturally, if not physically, genocidally motivated; and the only answer to the material and sociological problems of the natives and the moral and psychological problems of guilt and shame that the Liberal party has generated and imputes to the entire population of Canada is to allow the native spokespeople to push endlessly on an open door, demanding more money and more jurisdiction from the country and from a position of righteous superiority. Every individual and all recognized organizations have rights in Canada. There is only one sovereign government in this country and it does not have to negotiate on a basis of entire equality with lesser jurisdictions in matters of inter-provincial and inter-regional interest, a field that certainly includes natural resources and pipelines and other sophisticated means of surface transport. This government has conferred on the native people the unfettered right to pose as the principal defenders of the environment and to claim that practically any modification of the virgin state of the land Leif Ericson and Jacques Cartier discovered (more than 500 years apart) constitutes a desecration of the environment that can only be palliated and expiated by herniating payments of taxpayers' money to the natives. This makes negotiations practically impossible, as last week's fiasco demonstrated. The native people are not the only conscientious guardians of the environment and the federal government is the only entity whose right and purpose is to advance the national interest in all respects, balancing questions of environment, prosperity, justice and national security. The implicit admission on behalf of Canada that the natives were victims of some sort of attempt at quasi-genocide, and their elevation to the status of chief protectors of original and natural Canada, and the entrenchment of their right to comprehensive negotiation about anything they claim affects their lives as natives, has placed the whole country in the absurd position of being held to blackmail by this nebulous community. I have commented before on the Ktunaxa affair, which the Supreme Court has been deliberating on for 11 months. In it, natives claim that 25 years was insufficient time to consult fully on the proposed development of a ski area on part of a mountain that natives assert would banish the spirit of the grizzly bear, the basis of the religion of a band of 900 people, according to a divine revelation made to a deceased elder who did not mention this apparition for years. I respect religion and imaginative improvisation, but the combination of the two in this case has reduced this country to a laughing stock. Every sensible and decent Canadian wishes to help the natives and assist them in being happier and more prosperous. But Canada has never had genocidal ambitions toward them or anyone else, including the preposterous concept of cultural genocide. And by a policy of exaggerating their authority, vesting the natives with the right to extort treasure, retard reasonable development and tar the 95 per cent majority of Canadians of other descent as trespassers, interlopers, and usurpers, we have created a monster that will demand more and more until we either return to other continents that our ancestors departed, submit meekly to native dominance (colonialism reversed, consistent with Justin Trudeau's parlance at the United Nations), or come to our senses and devise a policy that is fair, but not based on unjustified moral self-flagellation, national self-impoverishment and incitement to profligate autocracy in the native communities. The more intelligent native leaders (and there are many of them) know that this nonsense has to end, and a number of prominent figures in the native organizations declined to sign the letter to Trudeau withdrawing from the talks. What is needed is a federal government course correction that asserts that Canada is legitimate and sovereign, and recognizes that many past treaties with natives could be fairly seen as uneven and in need of updating at least to reflect monetary inflation. But native organizations must have standards of leadership accountability consistent with the rest of the country, and all those who would rather abandon lonely and desolate habitats that have no possibility of being economically and socially sustaining should be enabled and assisted to do so and relocate. The United States treated the natives harshly, frequently engaged in wars with them, and never really conferred any special status on them. Today, they are all Americans, and some tribes are very prosperous because of oil and other resources on their lands. As the United States was never afflicted with the well-intentioned or guilt-riddled nostalgia that we were, their native policies and communities have latterly been much more successful than ours. We should humanely scrap unviable communities, ensure that all native people have adequate basic services, provide generous means to ease them into a new life or help them live traditionally in sustainable conditions, and have a system of eminent domain, ecological safeguards, and reasonable compensation where the national interest requires a highway or pipeline or other imposition on nature. Everyone has an equal interest in the environment, and no one group should be able to exercise such an interest as a weapon of mass destruction or hobbling of the public interest. What the country needs, we must have. Members of the League of Nations were amused between the World Wars by the annual "Canada speech" in which our delegate celebrated Canadian virtue and its distance from any world trouble spot. Those soporific addresses were rivetingly piercing treatises on contemporary political science compared to Justin Trudeau's recent national self-humbling over mistreatment of our natives to an assembly many of whose member nationalities would consider the lot of the Canadian natives a foretaste of paradise.